1000 jobs for BigData Analytics posted in 1 week !! I teach a BigData Analytics course in Bangalore and I routinely check up for jobs that exist in this domain on Naukri.com. (Naukri.com is the no.1 job site in the country). You must be hearing about BigData , Cloud technologies and Analytics being the ‘hottest’ jobs of the century. Quoting Harvard Business Review ,” Data Scientist: The Sexiest Job of the 21st Century. So who is a Data Scientist ? Looking into Naukri, I keyed in “bigdata analytics jobs” and 4025 jobs got listed . Wow !! this is phenomenal. How many jobs got loaded last week ? The search results were 967 jobs .Errr… 1k jobs got created in a week ? So how many in a day ? An unbelievable 230 jobs were less than 1 day old (20th Feb 2014 , 1:36 pm) . Clearly , India has a huge demand for BigData Analytics professionals . The next question which leaps’ to the mind is – How does the salary picture look? On an average, BigData Analytics jobs pay better!! The premium perhaps , is because of the rare nature of the skill . Why do I call BigData analytics a skill ? ‘Cause it is an amalgamation of coding (R , Hadoop etc. ), learning new technologies which are ever changing (Apache Hadoop etc.) , statistics and business. All these elements will be part of the job of the Data Scientist. To find the correct mix of attitude and skillsets will not be easy. It is also true that this area of work has a lot of new things happening, a lot of excitement as a part of the work. And will draw the ‘forever student at heart’. What is encouraging is the amount of online help and forums that exist and are populated every minute. There is always someone out there to help you when your boss may not be able to – just because these technologies are so new. This solidarity is a boon and forms the backbone for learning and working on these technologies . Do technology graduates have an edge in these jobs ? Of course you need to be tech savvy , but only technology cannot be reason you take this job . At the end, it will boil down to your belief that data can help business make the very best decisions . IF you are looking for ways to become a BigData Analytics professional , do look up our course at https://cloudthat.in/course/big-data-analytics-on-hadoop/ and reach out to us at 08880002200 / +91 7760673602 .
call me on 9867845470 i am interested in Hadoop … and i have few questions.. I am the beginner of Hadoop and MongoDB.Very much interested in analytics. I am struggling to choose Hadoop based projects .Kindly suggest me. 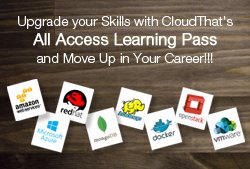 Benefit from our new offering 'All Access Learning Pass' – One pass to attend all our courses for 1 year & get trained from best of our Consultants who deliver training on AWS, Azure, OpenStack & Big Data. Register Your Interest Now! Please fill out below details & we will revert within 24 hours. © 2019 CloudThat Technologies. All rights reserved.